Sharjah: Sir Bu Nuair Island has been registered on the list of wetlands of international importance under the Ramsar Convention, the Environment and Protected Areas Authority in Sharjah announced. The 1,300-hectare island, which is located 65 kilometres off the UAE coast, is an environmentally protected area that supports a high biodiversity of rare species and plants. “The island is considered the second protected site in Sharjah and the fifth in the UAE to be registered as a Ramsar site,” said Hana Al Suwaidi, director-general of the Environment and Protected Areas Authority, at a press briefing. The UAE first became a contracting party to the convention of wetlands in 2007 with the aim of ensuring the conservation of their protected areas. “Wetlands are places that contain water for all or part of all the year and can be found inland and along the coast,” said Lew Young, senior regional advisor for Asia-Oceania, Ramsar. Habitats such as inland wadis, reservoirs, oasis and aquifers, as well as coastal khors, mangroves, seagrass beds and coral reefs are all considered wetlands. Sir Bu Nuair Island has recorded 40 coral species and 76 reef fish species, and is an important site for critically endangered hawksbill turtles. The island is also home to more than one per cent of the regional breeding population of the Sooty gull, a bird that is found in countries in Asia. Declared a protected site in 2000 by His Highness Dr Shaikh Sultan Bin Mohammad Al Qasimi, Supreme Council Member and Ruler of Sharjah, Sir Bu Nuair was also recognised as a Unesco World Heritage Site in 2012 on Unesco’s preliminary list. 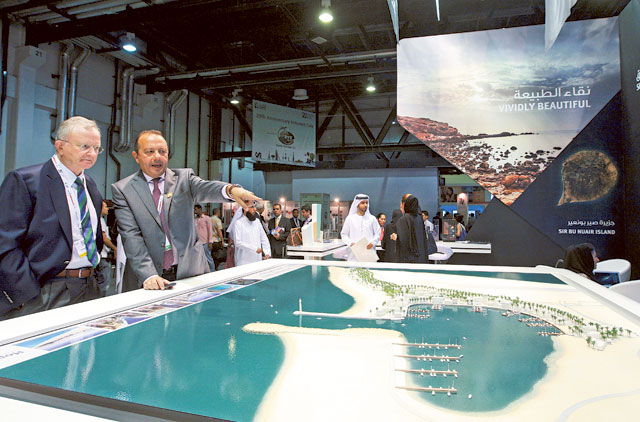 Currently uninhabited, plans to build a Dh500 million eco-tourism project on part of the island by 2017 have been announced by the Sharjah Investment and Development Authority (Shurooq). The authority announced earlier this year, a project to build a 70-100 room five-star hotel, souq and sports activities on the island. Located 40 minutes from Sharjah, the project will target residents and tourists and it will provide a variety of activities such as diving, cycling, hiking, sailing, canoeing and snorkelling, said Marwan Al Sarkal, Chief Executive of Shurooq.